The evening of 3 July 1943 would have been tense and heavy for the crew of the 15 Halifaxes of 78 Squadron based at RAF Breighton in East Yorkshire. They were due to take part in a heavy raid of hundreds of aircraft, using routes that were designed to avoid areas of heavy flak from the anti aircraft guns. Acting Squadron Leader Peter Bunclark and his crew took off at 23.09 hrs. in Halifax JD 203 with squadron recognition marking EY-Z and set course for Cologne, Germany. The Squadron Report tells us "15 aircraft detailed for operations. Target : Cologne. 14 aircraft successfully reached and attacked the Primary target. All reported seeing fires well concentrated. One aircraft returned early because of a hydraulic leak. Another aircraft had two engines damaged by enemy action over the target. Captain and Flight Engineer crash landed the aircraft in this country, remainder of crew baled out. All were uninjured." It was EY-Z which had two of its four engines damaged by enemy action. EY-Z lost one engine to flak over the target and it seems that a second engine failed on the way back, probably due to damage sustained in the initial attack. With two engines out of action on the same wing, the handling of EY-Z would have been very difficult, needing heavy application of opposite rudder in an effort to control an aircraft that would have wanted to fly to one side. It could well have needed two men to control it, even though all unnecessary equipment including machine guns would have been jettisoned over the sea to lighten the aircraft. It was probably this difficulty to maintain a course, which would have prevented Squadron Leader Bunclark from landing at any of the airfields near the South Coast. With time running out and the built-up areas of London fast approaching, but with most of his crew having baled out earlier, Bunclark's options were severely limited: a forced landing in open country was his best option. In the end the plane came down at Ashtead and the aircraft caught fire and burned out. Fortunately, Bunclark and Matthews were unhurt. EY-Z had flown its last sortie, but not so the crew. The crew was made up of British and Canadian personnel. The Pilot came in from 76 Squadron and had earlier won the DFM (Distinguished Flying Medal) in 1941. All of the crew who baled out after crossing back over the South Coast landed safely. When Sgt. K. T. Dixon, baled out over Hampshire he lost his flying boots on the way down and landed in a ploughed field. A farmer and his wife took him in and gave him clean dry socks before he was taken back to his unit. Apparently, the farmer's wife washed his socks and sent them to his Mother, who was very surprised to receive them in the post, as that was the first she had heard of her son's adventure! She subsequently also received the boots when they turned up in a field! Recently eyewitnesses recalled the last moments of Halifax JD 203, which they saw as youngsters, as it came down in Ashtead. It ploughed a long furrow in the ground, the wings were torn off by trees and it then caught fire and burned, but Sq. Ldr. Bunclark and P/O Matthews got out and were able to walk in to Ashtead village and subsequently return to their unit. We now know that Squadron Leader. Bunclark received the DFC (Distinguished Flying Cross) for his heroic efforts that night, to add to the DFM he had been awarded in December 1941. The others in the crew were promoted. The crew were shortly reunited - with the exception of Flt. Lt. Bradford who was posted to 20 OTU on 29 July 1943 and was replaced by P/O V.A. Robins - and they returned to flying together very soon, in another Halifax (JD 310) also designated EY-Z. Life returned to normal - whatever that meant in those days. They flew at least two further missions together but then, unfortunately, their good fortune came to an end. On the night of 24 August 1943, their replacement aircraft was shot down over Klosterfelde of Berlin by a German JU88 night fighter. It is known that when the order to bale out was given, the replacement wireless operator Pilot Officer Robins jumped first but sadly the rest of the crew were unable to get out probably because the aircraft went into a spin. Robins came down in the middle of some anti-aircraft positions and was immediately captured but just as he reached the ground he heard the explosion of the plane, which killed the remaining six crew. They were: Squadron Leader P. Bunclark, Pilot Officer J. S. Moore, P/O K. T. Dixon, P/O E. F. C. Matthews, P/O J. G. Castle (RCAF) and Warrant Officer L. A. Mallory (RCAF). They are buried in the Berlin 1939 - 1945 War Cemetery at Charlottenburg, Germany. Robins ended up in Stalag Luft 3 at Sagan - scene of the Great Escape. We don't know if he was one of the escapers, but he did survive the war and is still alive, although he does not enjoy the best of health. It should be borne in mind that these brave men were just some of the 55,573 airmen of Bomber Command lost during World War II. JD203 (the manufacturer's ref. no.) was built by the English Electric Co. at Preston, Lancashire. It was fitted with four Rolls Royce Merlin 20 engines and described as a Mark II, and was 'taken on charge' by 78 Squadron on 29 May 1943. Records indicate that 78 Squadron was in the process of moving from Linton-on-Ouse, Yorkshire, to Breighton in June of 1943. JD 203 was almost certainly a replacement aircraft for earlier losses and was given the squadron designation EY-Z. 78 Squadron lost a total of 182 aircraft during World War II. Handley Page produced the H.P.56, a twin Vulture-engined design to meet Air Ministry Specification P.13/36 but performance was found to be lacking. Modifications resulted in the definitive H.P.57 "Halifax" (following the practice of naming heavy bombers after major towns, in this case, Halifax, West Yorkshire); the aircraft was enlarged and powered by four 1,280 hp Rolls-Royce Merlin X engines. Such was the promise of the new model that the RAF had placed their first order for 100 Mk I Halifaxes "off the drawing board" before the first prototype even flew. The maiden flight of the Halifax took place on 24 September 1939, shortly after the start of the war. The production of the Halifax then began at English Electric's site at Samlesbury, Lancashire with over 2,000 bombers being built at the factory during the war. The Mk I had a 22 ft long bomb bay as well as six bomb cells in the wings, enabling it to carry 13,000 lb (5,897 kg) of bombs. Defensive armament consisted of two .303-in Browning machine guns in the nose, four in a tail turret and, in some aircraft, two waist guns. Subtle modifications distinguished the Mk I aircraft. The first batch of Mk I Halifaxes were designated Mk I Series I. The Mk I Series II increased the aircraft's gross weight (from 58,000 lb to 60,000 lb) and the Mk I Series III increased fuel capacity. The Halifax Mk I series had a serious flaw in the design of its tail units that caused it to go into a steep, uncontrollable spin if the aircraft was flung about vigorously. This fault undoubtedly caused a number of fatal crashes. The most numerous Halifax variant was the B Mk III of which 2,091 were built. First appearing in 1943, the Mk III featured the Perspex nose and modified tail of the Mk II Series IA but replaced the Merlin with the more powerful 1,650 hp Bristol Hercules XVI radial engine. 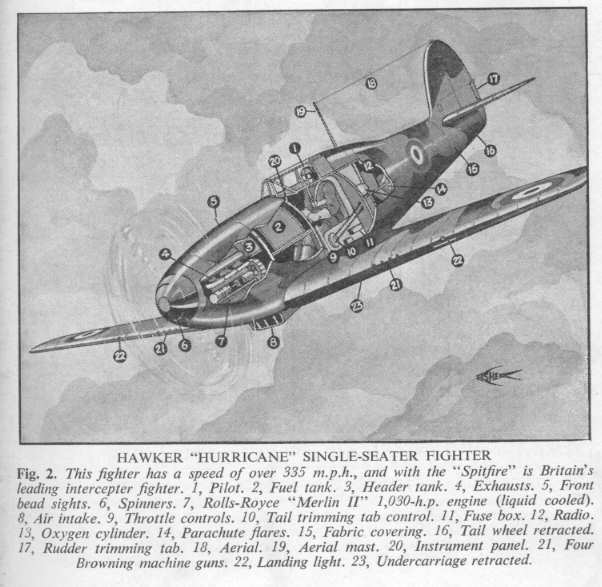 Other changes included De Havilland Hydromatic propellers and rounded wing-tips. The Mk IV was a non-production design using a turbocharged Hercules powerplant. The definitive version of the Halifax was the B Mk VI, powered by the 1,800 hp Hercules 100. The final bomber version, the Mk VII, reverted to the less powerful Hercules XVI. However, these variants were produced in relatively small quantities. The remaining variants were the C Mk VIII unarmed transport (8,000 lb cargo pannier instead of a bomb bay, space for 11 passengers) and the Mk A IX paratroop transport (space for 16 paratroopers and gear). A transport/cargo version of the Halifax was also produced, the Handley Page Halton. Total Halifax production was 6,176 with the last aircraft delivered in November 1946. In addition to Handley Page, Halifaxes were built by English Electric, Fairey Aviation, Rootes Motors(Rootes Securities Ltd.) and the London Aircraft Production Group. Peak production resulted in one Halifax being completed every hour.